I'm surfacing again! The cross stitch projects are done for now, and I'm working on some new things. One of them is something I started many months ago. I ran into some road blocks because my idea for how to assemble it didn't work, so I needed a little time to figure it out. Or a lot of time as it turned out! I got this idea for a different sort of project when I saw someone's art project that had a whole room set up with with places settings like for a party. Each plate had a different sculpture on it in some kind of clay or some such material. It made me think of doing something with needle work and food. And since there is no better food than cake, so I thought I might start with that. I decided to begin with fairly simple embroidery on this untested idea. I used fabric paint for the colors of the cake. I sewed the pieces together by hand. This project is not a "softee". There is sturdy matboard giving it shape inside. I made the cream blob out of fimo. The plate and the spoon are part of the project. They are not just props for the photo. Unfortunately, I haven't had time to go scouring flea markets for the ideal plate, which would be some nice little china piece with delicate flowers around it. The spoon is a silver spoon from Mr Floss Box's grandmother. I will replace it with a cheaper small fork though. So I don't consider the project quite done yet, but it's time to post it anyways. This was fun to do. I could imagine doing a whole series of them. I am not sure I will make it, but I will at the very least do another that is more elaborate. A family member who saw my cake actually thought it was real!!!! My embroidery journal project is now complete! I wanted to do something different this month, something that would be a little challenge of a different sort. So I chose a door to a magical, walled forest. I had to figure out ways to make the walls so they had dimension, and the door I wanted to be able to open. The walls are bits of a stiff interfacing that I covered with fabric. The gate posts are wrapped up pipe cleaners. I couldn't get the wire through the back of the fabric so I glued the ends so the floss wouldn't unwind and cut off the wire. I used a black permanent marker to cover the white that showed. My door is fabric covered interfacing too. I used several layers and ended up using glue in the end to hold all the layers together. If I did it over, I would have planned that part differently. The door is held shut with the help of an eye. It lifts up, so the door can open. I had to put something behind the door, so I choose to represent a magical rose bush that blocks the way in. What does my little walled in world represent? Good question! I will answer with it's the way into my magical embroidered world where anything is possible, and there are always great projects to be done!!! 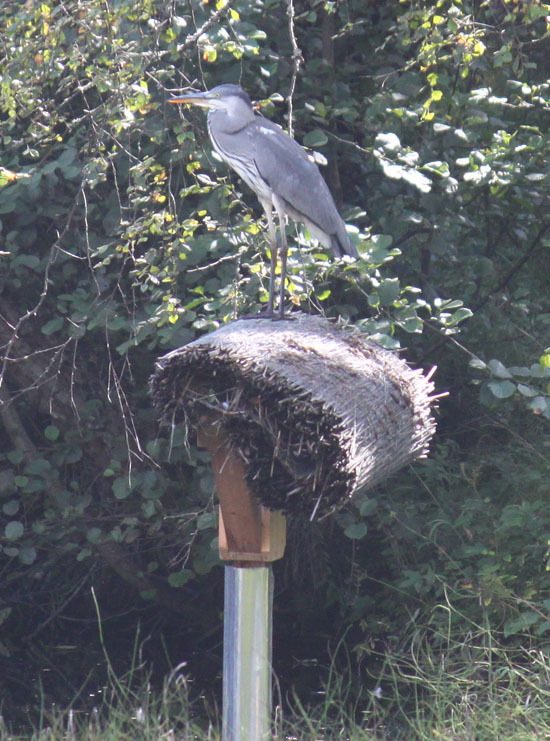 We've had a heron visiting us during August. I suppose it found out we have little fish and crayfish in our water. No doubt a tasty snack!